Email marketing can be extremely effective for acquiring and retaining customers. Only thing is, you have to have stuff to send out in your email campaigns. Your customers might be interested in your product updates, sure, but will that really get a conversation going and be effective marketing? I’ve gotten a lot of questions about how to use quizzes in email campaigns, so I’m going to do a step-by-step walk through of how to send out a quiz using Mailchimp (the other programs are very similar in setup). Here we go, in five steps. Get the link to your quiz from your Interact dashboard under (social share). If you’ve embedded your quiz in a blog post, grab the link to your blog post. I’d like to dispel a myth right off the bat. You can’t put a functional quiz inside of an email, because emails don’t support iframes. Whew, now that we’ve got that out of the way we can focus on how to get your quiz into your email campaign in a fluid and attractive way. What’s essentially happening when you share a quiz in an email campaign is that you are sharing a link to the quiz in a nice way. 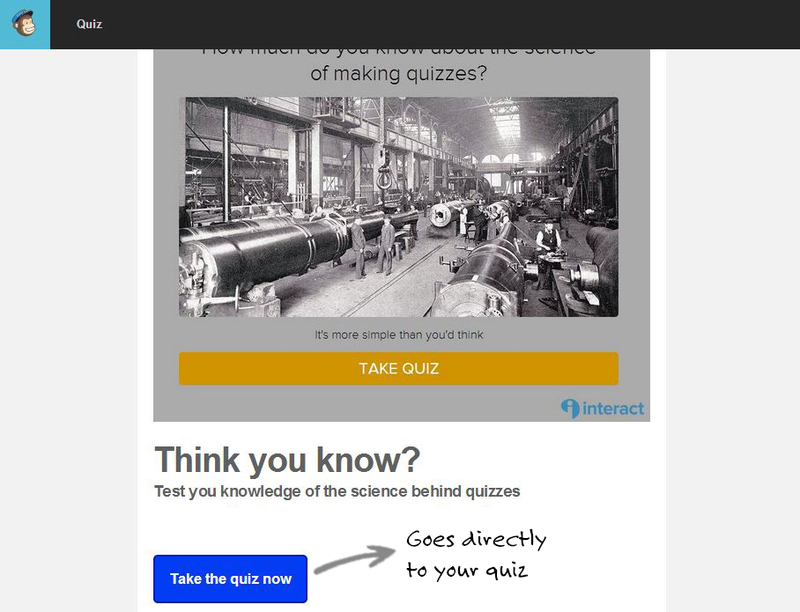 In my example campaign below, I’ve included a screenshot of what the quiz looks like along with a bit of text that explains what’s going on and a button that links out to my quiz. 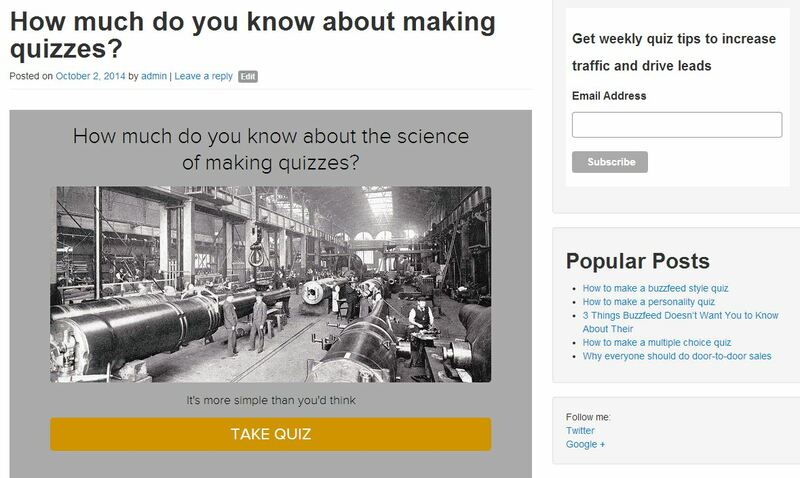 Visitors who click through to your quiz will get one of two experiences. The first one is a page like I have pictured below where the quiz takes up the entire web page and is the only thing on the web page. This is the default view for interact quizzes (that aren’t on the free plan). We set up pages like this so you don’t have to have a blog or website to run a quiz, you can use ours. Option 2, is what you see below here, where the quiz is embedded into my blog. This is the option I actually recommend, as it ensures you get people on your site and provides an opportunity for them to continue checking out pages on your domain. Not every quiz is a hit. We’ve seen customers try three or four times before creating the quiz masterpiece that got 25,000 views. Use the analytics that Interact provides to see which questions were popular and which weren’t, then try again. Sometimes, it just clicks and you have a great experience. One person who had such an experience was Pam Mills from the Denver School of Hypnotherapy.